Swim England Synchro’s Age Group squad landed medals in all four events with an impressive campaign at the 2017 Primorje Cup in Croatia. Millicent Costello started the ball rolling with a first place in Figures. The City of Leeds swimmer scored 64.8833 to finish first out of the 93 athletes taking part, all aged from 13 – 15. Daisy Rushton (fifth, 62.8722), Mimi Gray (sixth, 62.7333), Abigail Taylor (eighth, 61.9556) and Isobel Blinkhorn (ninth, 61.8556) also secured top 10 finishes for Figures. Gray then returned to the pool to scoop gold in the Solo and silver in the Duet. 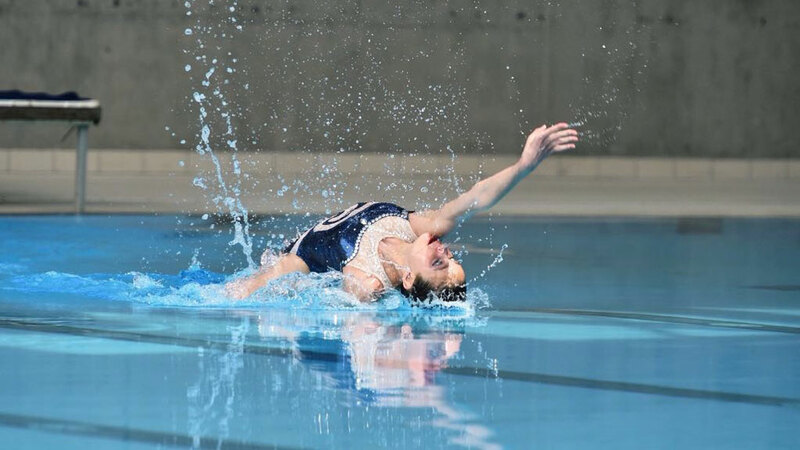 The Reading Royals swimmer, who won a hat-trick of National Age Group golds last December, scored 70.0000 for her Solo free routine to finish on 132.7333 overall. Reading teammate Isobel Blinkhorn also reached the podium for Solo, scoring 68.3666 for her routine to collect bronze on 130.2222. Gray then combined with Alyssa Basinger for the Duet as the pair received the highest score of the competition with 67.3668 for their free routine. Gray and Basinger were narrowly denied overall gold as they finished on 128.1974 overall. Turkey’s Beliz Doga Bulbul and Talya Ozkaya ultimately took the top spot on 128.2362. Walsall’s Olivia Baker and Robyn Swatman also competed in the Duet, placing fifth for their routine with 63.9333 and finishing seventh overall on 120.8055. The English squad rounded off their competition with gold in the Team event. The team scored 68.7331 for their free routine to finish on 130.0609 overall. Turkey placed second on 128.8632 while Czech Republic took bronze on 126.4178. The English team comprised of Basinger, Eleanor Blinkhorn, Isobel Blinkhorn, Costello, Gray, Cerys Larsen, Rushton and Taylor, while Baker, Swatman and Grace Cruickshank were reserves.